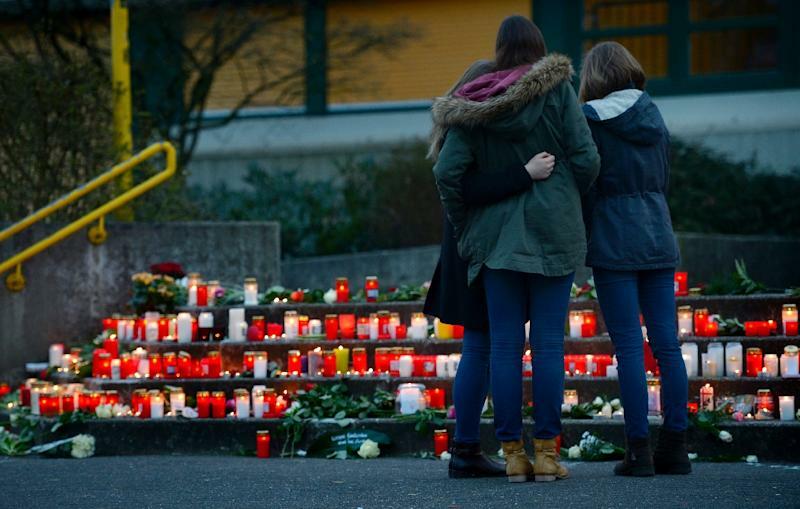 Haltern (Germany) (AFP) - A German town mourned 16 teenagers who were among the 150 people killed in a plane crash in the French Alps Tuesday as they returned from a school exchange in Spain. Fellow students shed tears, laid flowers and lit candles outside the high school which the mostly 15-year-old victims and their two teachers came from. 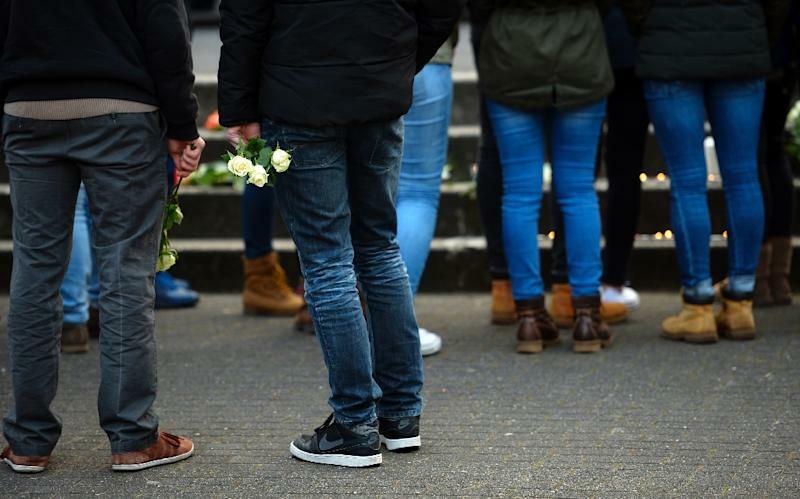 "This is certainly the darkest day in the history of our city," said Bodo Klimpel, the mayor of Haltern am See, the students' hometown 70 kilometres (40 miles) north of Duesseldorf, the doomed flight's destination. "The city is deeply saddened ... Everyone is in a state of shock. It is the worst thing you can imagine," he said, holding back tears in a press conference. The 10th grade students and their two female teachers had been on a week-long exchange trip in Llinars del Valles near Barcelona, paying a reciprocal visit after Spanish students came to Haltern in December. The students' names were on the passenger manifest of the crashed Germanwings flight, said Klimpel, meaning that "we have to assume the worst". French officials said there were no survivors among the 144 passengers and six crew aboard the Airbus 320 jet when it crashed en route from Barcelona to Duesseldorf near the ski resort of Barcelonnette. "It's so tragic, so sad, so unfathomable," said Sylvia Loehrmann, education minister for the state of North Rhine-Westphalia. As news spread of the missing aircraft, the school, the Joseph Koenig Gymnasium, sent students home for the day. Many then returned to lay flowers and light candles, and a vigil continued after dark. "We still can't believe it," said a tearful mother, Suzanne, 47, who went to the school with her two sons, Lukas and Nils, to honour those who died and support their loved ones. "We were told the news around one o'clock in the afternoon and after that the students were allowed to go home," said Lukas, 11, who added that he knew one of the victims. In the town of 38,000 people, located in a traditional mining area in western Germany, churches opened their doors to grieving families and friends of those missing presumed dead. Another mother at the school vigil, Angelika, 57, said: "We came to show our love for all the parents who lost their children." "I knew this school exchange very well, my son did it a few years ago, so I feel particularly touched." On a ping-pong table covered with candles and roses, the names of victims were written on a large white candle. One social worker said: "We are here to help as the first shock hits. We try to be there and watch the people overcome by grief. We try to tell them that they're not alone. "You can't really speak at a time like this. The first step is just to accept that what has happened is true." 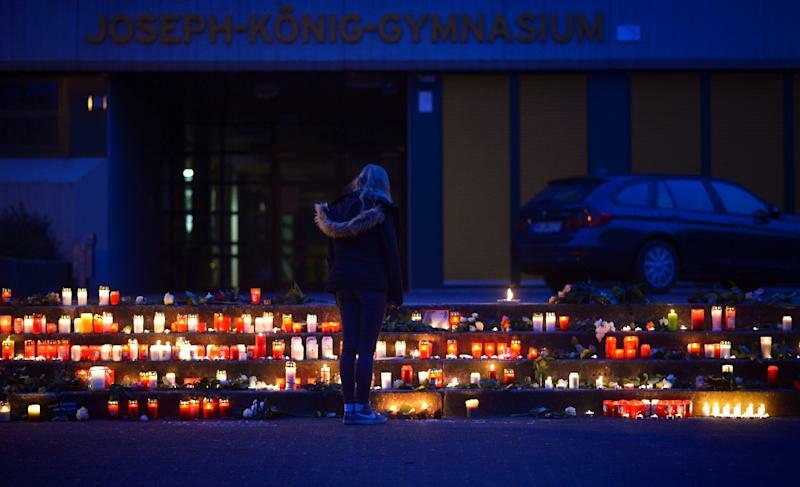 On Wednesday the high school was set to hold an event to honour the victims of the tragedy. "There will be an opportunity for the students to speak about the terrible thing that happened", said Klimpel. Marti Pujol, mayor of Llinars del Valles, a village near Barcelona, said pupils at the Instituto Giola which the German visitors had attended were also being given counselling to help cope with the tragedy. German Chancellor Angela Merkel earlier called news of the air crash, which killed 67 German nationals, "a shock which has plunged us into deep mourning in Germany, France and Spain". Condolences poured in on social media, including from a footballer who was born in Haltern, Germany defender Benedikt Hoewedes. "Everyone knows that I come from Haltern am See and I still have lots of friends and relatives there," the World Cup winner wrote on Twitter. "I am unbelievably sad over this terrible accident and wish all the families and their loved ones the strength to get through this."